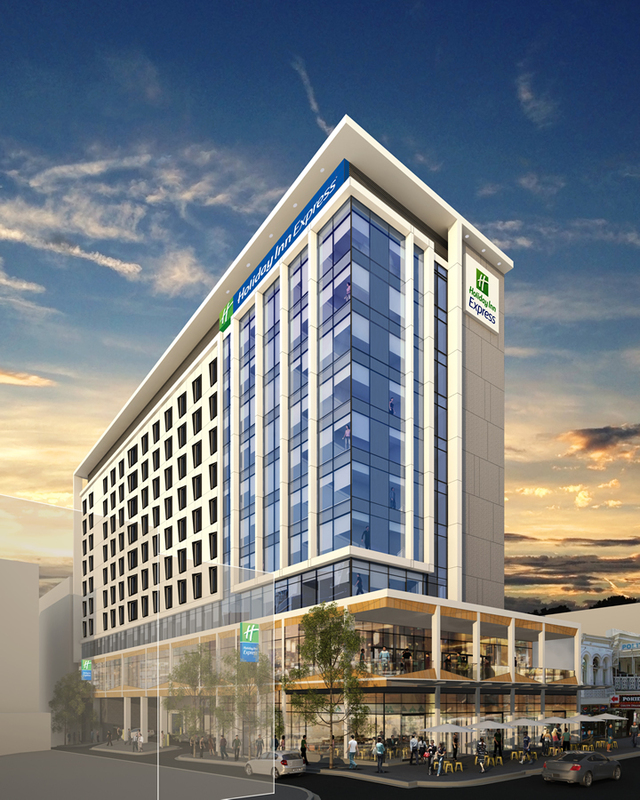 Adelaide, Australia, 2015-4-30 — /Travel PR News/ — InterContinental Hotels Group (IHG) and international investment company Pro Invest Group have signed a franchise agreement for a 245-room Holiday Inn Express hotel in Adelaide’s Central Business District (CBD). The hotel is the third to be signed under the master development agreement between IHG and Pro Invest, which will see the investment company develop 15 Holiday Inn Express hotels across Australia by 2025. The first two hotels will open in Sydney’s Macquarie Park, North Ryde in the first quarter of 2016, and Brisbane’s Spring Hill in the third quarter of 2016. The new build hotel will be situated on the city’s thriving Hindley Street, in close proximity to North Terrace, the Adelaide Convention Centre and the upcoming Royal Adelaide Hospital. Leisure travellers can enjoy a short walk to the Adelaide Casino and local sporting hub Adelaide Oval, whilst the accessibility to major corporate offices within the CBD from the hotel will be a draw for business travellers. The hotel will also have two meeting rooms for small functions and events. IHG currently has 24 hotels operating under three brands in Australia:InterContinental, Crowne Plaza and Holiday Inn, with a further four hotels in the development pipeline, including Holiday Inn Express Sydney Macquarie Park, which will mark the launch of the brand in the country when it opens in early 2016. There are currently 2,365 Holiday Inn Express hotels (more than 229,000 rooms) open across the globe, with a further 522 hotels (nearly 63,000 rooms) due to open in the next three to five years. IHG (InterContinental Hotels Group) [LON:IHG, NYSE:IHG (ADRs)] is a global organisation with a broad portfolio of hotel brands, includingInterContinental® Hotels & Resorts, HUALUXE® Hotels and Resorts,Crowne Plaza® Hotels & Resorts, Hotel Indigo®, EVEN™ Hotels,Holiday Inn® Hotels & Resorts, Holiday Inn Express®, Staybridge Suites® and Candlewood Suites®. In January 2015, IHG acquiredKimpton Hotels & Restaurants, the world’s leading boutique hotel business. IHG manages IHG® Rewards Club, the world’s first and largest hotel loyalty programme with over 84 million members worldwide. The programme was relaunched in July 2013, offering enhanced benefits for members including free internet across all hotels, globally. IHG franchises, leases, manages or owns over 4,800 hotels and more than 710,000 guest rooms in nearly 100 countries, with over 1,200 hotels in its development pipeline. Over 350,000 people work across IHG’s hotels and corporate offices worldwide. In January 2015 we completed the acquisition of Kimpton Hotels & Restaurants, adding 62 hotels (11,300 rooms) to our system size and 16 hotels to our development pipeline. Visit www.ihg.com for hotel information and reservations andwww.ihgrewardsclub.com for more on IHG Rewards Club. For our latest news, visit: www.ihg.com/media, www.twitter.com/ihg,www.facebook.com/ihg or www.youtube.com/ihgplc. This entry was posted in Business, Hospitality, Hotels, Travel Management, Travel Services and tagged Holiday Inn Express® hotel, IHG, Karin Sheppard, Pro Invest Group, Ronald Barrott. Bookmark the permalink.